Mulch is primarily organic material that is spread over the surface of the soil around trees to improve the soil conditions. Mulching trees does not just enhance the beauty of your landscape but it also holds numerous advantages. Mulch provides a protective layering which prevents trees from harm caused by pests and keeps the soil near the tree moisturized and insulated against extreme weather conditions while controlling the growth of weeds. Mulching trees also reduces the damages to the trees caused by lawn mowers. How Can Improper Mulching Harm Trees? It can also harm trees by stimulating the development of fungus and causing insect infestation. How to Mulch Trees Properly? Arrange natural organic mulch such as hardwood chips and rake. With a shovel, remove old mulch piled up against the tree trunks if there is any. This will prevent the fungal growths and also get rid of insects present in the old one. Clear the space around the trees by removing all existing debris, weeds, twigs and fallen limbs. Make the surface around the trees perfectly even with the help of a rake. 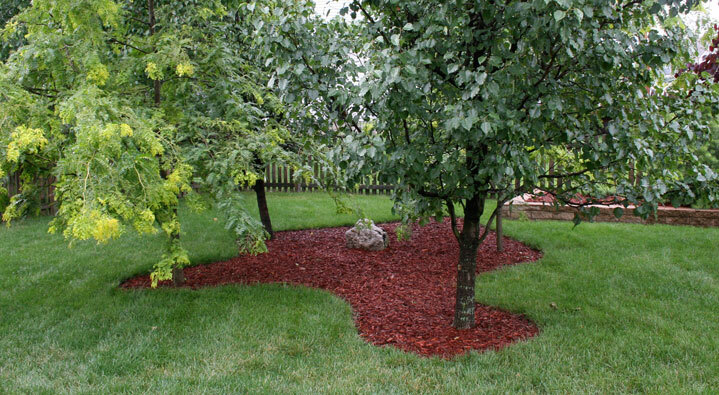 Apply mulch in a circular way all around the tree. a. Six inches from the tree trunks in case of young trees. b. 12 inches from the tree trunks of fully grown and mature trees. This is done to prevent the growth of fungus and infestation of insects. Apply at least 2 inches to 4 inches of mulch layering if the site is well drained. However if the natural soil drainage is poor, then apply a thinner layer. The organic matter of the soils in the urban environments is less; therefore, applying mulch in these amounts is a good way to imitate the natural environment for healthy growth of trees. Spread the organic mulch evenly across the circular region. Don’t allow the mulch to get into contact with the tree trunk. Never create “mulch volcanoes”, that is, excessive mulch piles around the base of the trunks or stems or else it would cause the problems mentioned above. Instead mulch the trees by creating a donut shaped hole. In an ideal condition, the mulch would cover similar diameter on the ground as the crown of a tree. Give water to the soil of the mulched tree if it appears dry. Pull out weeds from the mulched trees all through the season. Always make use of natural organic mulch rather than artificial mulch which has a tendency to harm the roots as neither water nor oxygen can seep through it easily. Custom Tree Surgeons is a Jacksonville arborist who specializes in tree trimming, tree removal, stump grinding and emergency tree service. If you are in need of tree services for your home or business call us today at (904) 292-9226.